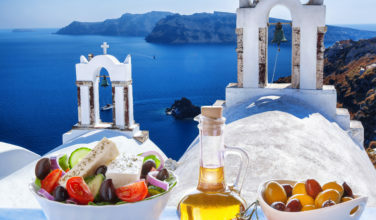 The Greek island of Santorini is a beautiful spot, known for its idyllic sunsets. Fira is the main town on the island and serves as its transit hub. A cruise ship stop, thousands of passengers enter and exit Fira daily and enjoy its many shops, bars, and restaurants that line the narrow streets and the beautiful views over multicolored cliffs. There is plenty to do and see in Fira. A popular tourist location, plenty of tours are available that suit a variety of tastes. Visitors can take tours to the volcanic island of Nea Kameni, to the volcano and hot springs of Palia Kameni, tours to nearby Thirasia and Oia, sunset boat tours, and wine tasting bus tours to the popular vineyards of the area. 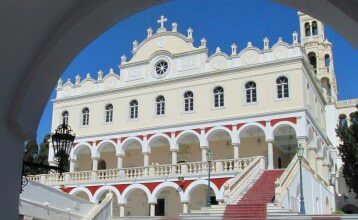 Popular museums in Fira include the Megaro Gyzi Museum and the Museum of Prehistoric Thera. The Megaro Gyzi Museum is a local history museum that celebrates Santorini life. It includes photographs of the town dating back to the early 20th century, historic manuscripts and documents, modern paintings of Santorini, and samples of the various types of volcanic rock found on the island. The Museum of Prehistoric Thera is the island’s top museum. This modern museum presents items found in the prehistoric city that were buried under ash near Akrotiri. The majority of the museum’s pieces date from the Late Cycladic Period. The highlights of the museum are its colorful, two dimensional wall frescoes that were influenced by the wider Minoan culture. Everything is described in English. If you enjoy hiking and are in good shape, the scenic hike from Fira to nearby Oia is recommended. There are fantastic views from the cliff-top trail. The route passes through the villages of Firostefani and Imerovigli and is about 5 miles long. The route can be strenuous and has very few shady spots. If you plan to hike the trail, be sure to wear adequate sneakers and bring plenty of water. Hikers can take a bus or taxi back to Fira after completing the hike. 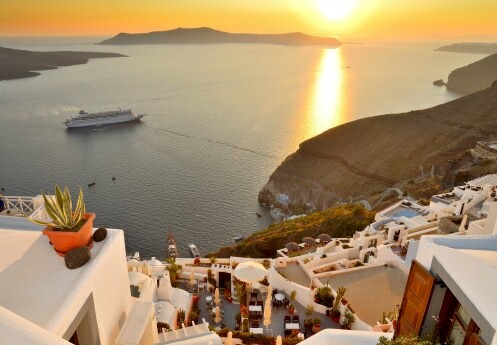 While nearby Oia is the best known for its Santorini sunsets, Fira’s sunsets are quite beautiful too. If you can’t make it to Oia, you can still enjoy the sunset. The best viewing spot depends on the time of year. For some of the year the sunset is blocked by the island of Thirassia, so be sure to ask where the best spot for viewing is when you arrive. Visitors should be warned of the tacky part of town known as “Gold Street”. Cruise ship tourists are seen as built-in business and this area is full of goods with high prices that aren’t great quality. It’s recommended that you shop elsewhere. As the transit hub of Santorini, there are plenty of bus connections to popular destinations including Oia (25 minutes), the airport (15 minutes), Kamari (10 minutes), Akrotiri (30 minutes), and Perissa (30 minutes).